Indian Coast Guard is going to recruit fresher candidates in India for Assistant Commandant Posts. So, those candidates who are willing to work with this organization they May apply for this post. Last Date of Apply 20-May-2017. Total numbers of vacancies are Not Mention. Only those candidates are eligible who have passed Bachelor’s degree of recognized university with minimum 60% marks in aggregate (ie. 1 st Semester to 8th Semester for BE/B.Tech or 1st year to last year for Bachelor Degree Candidates wherever applicable). Mathematics and Physics as subjects & up to intermediate or class XII of 10+2+3 scheme of education or equivalent with 60% aggregate marks in Maths & Physics. 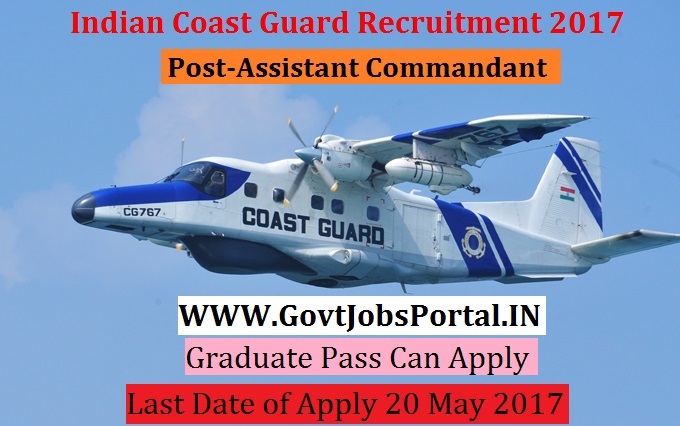 Indian citizen having age in between 20 to 35 years can apply for this v Indian Coast Guard Recruitment 2017. Educational Criteria: Only those candidates are eligible who have passed Bachelor’s degree of recognized university with minimum 60% marks in aggregate (ie. 1 st Semester to 8th Semester for BE/B.Tech or 1st year to last year for Bachelor Degree Candidates wherever applicable). Mathematics and Physics as subjects & up to intermediate or class XII of 10+2+3 scheme of education or equivalent with 60% aggregate marks in Maths & Physics. 2: Selection will be held on Discussion Test.